ISBN 978-1-4472-5625-0, Tor UK, MMPB, 358pp, UK£7.99. November 2015. The Masked City is the sequel to Genevieve Cogman’s well-received debut The Invisible Library. It is not High Literature. High Literature was never this fun. Mmm, stew. My metaphor might have got away from me there. Where was I? Right. The Masked City. Irene is a Librarian, an employee of an interdimensional Library. The Library. The Library helps stabilise the multiverse. (Being a library, it does so through collecting books. Or, at least, the Librarians collect books for it.) Across the multiverse, alternate Earths can have magic or technology, or both, or neither: they can be high in order (dragons prefer order) or high in chaos (spread by Fae), or somewhere in between. After the events of The Invisible Library, Irene found herself the Resident Librarian in the Victorianesque London of just such an in-between world, with Kai, a youthful dragon-in-human-form, for an apprentice, a friend in Vale — a Sherlock Holmesian Great Detective — and an occasional adversary in the form of Lord Silver, the most powerful of the local Fae. But there are factions and plots afoot. Kai is kidnapped — and it’s quite difficult to kidnap even a young dragon — and Irene’s investigation of how (and by whom, and where they’ve taken him) keeps getting interrupted by someone else’s werewolf thugs. It soon becomes clear that this is a plot by Lord Guantes, an old arch-rival of Lord Silver, and his Lady. They’ve taken Kai to a high-chaos world and intend to auction him off to other powerful Fae, in an attempt to start a war between the dragons and the Fae, and raise themselves up the ranks to Most Powerful in the tumult. Irene’s going to get Kai back. If she can. Without orders — or permission — from her superiors in the Library. With Lord Silver — unreliable at the best of times — as her only ally, she has to infiltrate a high-chaos world and rescue Kai from an all-but-impenetrable prison, all the while avoiding the attention of Lord Guantes and the Fae rulers of this alternate. And that may be harder than it seems. Because Fae are creatures of story, and in the higher chaos worlds that are the natural habitat of the more powerful of their kind, coincidence warps to form narrative patterns. Is Irene the hero of her own story, the comic relief in another, or the villain in Lord Guantes’ play? In a 1700s-esque Venice where it’s always Carnival and never Lent, where masked black-clad agents of the Council of Ten haunt every shadow, Irene has to be on top of her game if she’s going to escape with her skin, and Kai’s, intact. There is so much to like here. The madcap pace of Irene’s rush from caper to caper! The group of young and ambitious Fae she falls in with while undercover, all of whom with complaints about their own patrons and their own ideas about their roles in the unfolding dramas! Arguments about Fae etiquette, which is batshit and hilarious. Zayanna, whom Irene gets drunk as a distraction and who keeps lamenting the fact that she never gets to seduce any heroes — and then makes Irene promise to let her try to seduce her, later. The way in which Cogman has such obvious affection for so much genre furniture, but not so much affection that it gets in the way of breaking convention when that would be more fun. The Masked City has a great and pleasing energy. It’s one of the most purely entertaining novels I’ve read this year. I can’t think about it without grinning. It made me very happy, and I can wholeheartedly recommend it to anyone who wants a really fun batshit pulpy fantastic ride. Good book. A+. Would book again. The world needs more like it. This review has been brought to you thanks to my generous Patreon backers. That’s Genevieve Cogman’s THE MASKED CITY, Sonya Taaffe’s GHOST SIGNS, and Julia Knight’s WARLORDS AND WASTRELS. New post live at Tor.com. Richard Morgan, The Dark Defiles. Gollancz, 2014. Read for review for Strange Horizons. Interesting and effective conclusion to trilogy. Karina Sumner-Smith, Radiant. Talos, 2014. Debut. Read for Sleeps With Monsters. Fun, interesting, solid beginning. S.L. Huang, Half Life. Ebook, 2015. Copy courtesy of author. Sequel to Zero Sum Game. Read for Sleeps With Monsters. Fun, hectic, fast. 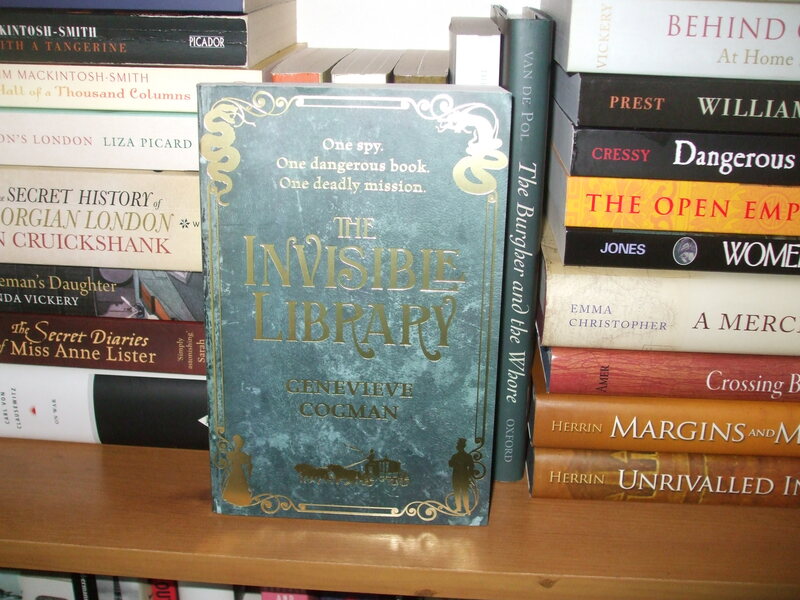 Genevieve Cogman, The Invisible Library. Tor UK, 2015. Copy courtesy of publisher. Debut. Read for Sleeps With Monsters. Fun, demented hilarious fun. Mike Shepherd, Kris Longknife: Tenacious. Ace, 2014. Yes, I am still reading this series. Things blow up. It is not at all like Target (THAT BOOK WHY), and it is fun. Gail Simone, Red Sonja: The Art of Blood and Fire. Dynamite, 2014. It is like having Xena back, except with less moralising and more PUNCHING PEOPLE INNA FACE. YAY. More please. Gail Simone, Tomb Raider: Season of the Witch. Dark Horse, 2014. Bit like an acid trip. Doesn’t make a great deal of narrative sense. On the other hand, lots of fun, and Lara PUNCHING PEOPLE INNA FACE and female friendship and taking care of people whom you care for, and also bits of it are set in Dublin and I quite like that, right. Why yes, I am pro LADIES PUNCHING PEOPLE INNA FACE. And very shiny looking it is, too.